Now there is a few things you need to remember when you are cutting a tree limb. Where the limb meets the base of the tree is the important part. 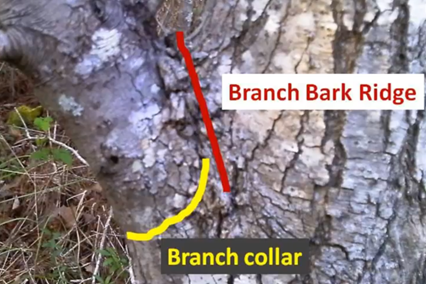 At the base of the limb, there exists something known as the ‘branch collar.’ With some trees, this collar is very distinctive and thus easy to see. However, with other trees, this collar is not as easy to find. It’s vital that you locate this collar and avoid cutting into it at all costs when you remove a tree limb. An image of this collar are provided below. At the base of the limb there also exists a ‘branch bark ridge.’ This is located in the ‘V’ section where the limb attaches to the tree. This is the area you must protect when removing tree limbs. You do not want to cut into this area. Why? Because this is where hormones are produced by the tree to help seal off the wound created when you cut off a limb. The tree uses these hormones to compartmentalize and seal off wounds. 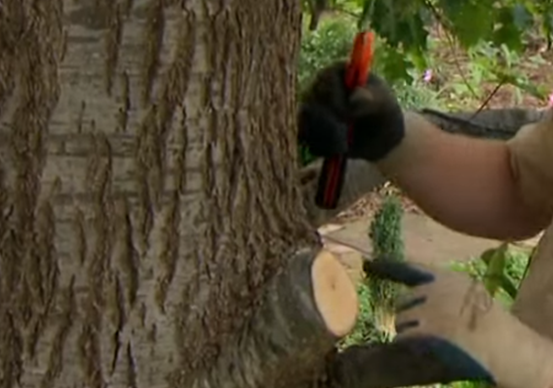 The tree isn’t able to replace tissue that’s been damaged when a limb is removed. Thus, you must make sure that when you make this cut, no area of the branch bark collar is affected. You do not want to cut into this area. Why? Because this is where hormones are produced by the tree to help seal off the wound created when you cut off a limb. The tree uses these hormones to compartmentalize and seal off wounds. The tree isn’t able to replace tissue that’s been damaged when a limb is removed. Thus, you must make sure that when you make this cut, no area of the branch bark collar is affected. When a tree limb is removed, it’s also essential to consider the weight of the limb. If you simply start to cut without supporting the weight of a limb, when you start to make your cut, the weight of the limb may cause it to suddenly drop to the ground. 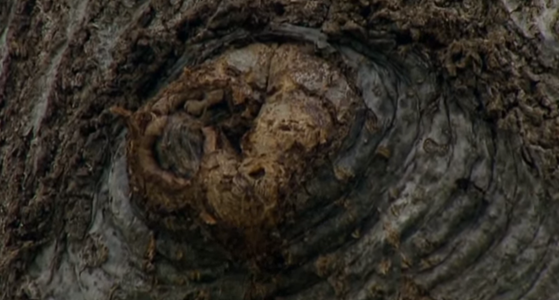 This unexpected drop could leave a huge tear in the tree’s bark. 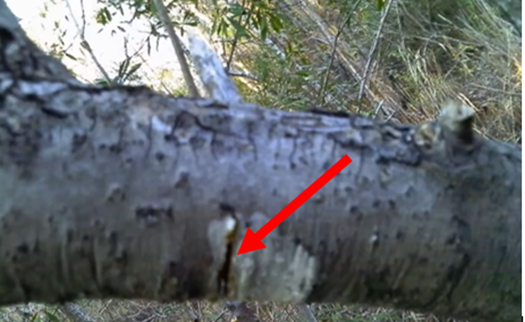 This tear could take the tree may months to seal off, leaving the tree vulnerable to infection or termite attack. So how do we avoid this fate? 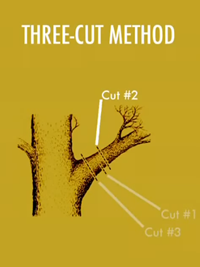 It’s simply a matter of implementing the three-cut method. But what is the tree cut method? 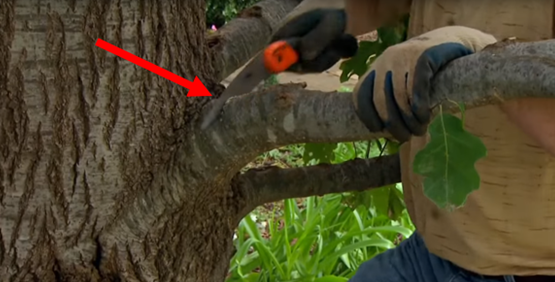 In this post, we will describe how you can implement this method to ensure you do not inflict unnecessary damage to your tree when you remove a limb. As the name suggests, the three cut method involves you making three cuts across the affected limb. The first cut involves making a cut around 12 inches away from the base of the limb and the tree trunk. This cut must be an undercut. Why? 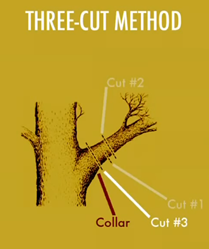 Because an undercut means if the limb drops to the ground under the weight of the tree during the second cut, no damage will be inflected to the bark of the tree because the first undercut will prevent the bark rip from spreading to the trunk of the tree. Now the bulk of the weight of the limb should have successfully been eliminated during cut #2 above. Now you are able to make the third and final cut. This cut is made just before the branch bank collar mentioned above. It’s essential you do not cut into the collar for reasons stated above. As you cut, ensure you hang on to the remaining limb stump to ensure it does not break off and rip the bark located on the tree trunk. It’s essential you do not cut into the collar for reasons stated above. As you cut, ensure you hang on to the remaining limb stump to ensure it does not break off and rip the bark located on the tree trunk. The trees hormones have successfully sealed the affected area. As the tree matures, the left over limb stump will completely vanish to the naked eye. If you are unable to perform the above task due to the height of the tree limb you intend to remove, why not have our tree surgeons perform the three cut method for you? For Liverpool tree surgeons, contact us today on 0151 727 0136 or submit an enquiry through this website. We offer a free site survey before any work is carried out. Please contact us today to avoid disappointment.